April 2017 – A field survey of interviews with hundreds of rural families across Cabo Verde, Guinea-Bissau, São Tomé and Príncipe indicates that although the use of organic alternatives to hazardous pesticides is gaining pace, the threats posed by the misuse of toxic chemicals persist. The findings were presented at a subregional consultation meeting held by the Rotterdam Convention (RC) and FAO in Cabo Verde’s capital, Praia this March. Representatives from Angola, Burkina Faso, Brazil, Guinea-Bissau, Italy, Mozambique, São Tomé and Príncipe joined participants from the islands off the west coast of Africa to discuss further measures to reduce risks, improve the enforcement of existing legislation and continue with the implementation of the RC. Since July 2016, RC technical experts have stepped up their work in these countries. The target of their programme is to increase social protection and limit environmental damage by extending the available information on alternatives to conventional pesticides. The preservation of natural resources stands at the very helm of FAO’s undertaking to support nations through policy advice, analysis and the provision of technical assistance. “We know that the global population is growing rapidly, and with it the demands placed on agriculture. This is why the sustainable intensification of agriculture is so important. Working towards safer alternatives to hazardous pesticides is part and parcel of achieving this,” said FAO Programme Officer for the RC, Elisabetta Tagliati. In Cabo Verde, interviews with the heads of 100 rural families found that less than 30 percent of those consulted used protective clothing while coming into contact with pesticides. Moreover, islanders were not legally bound to possess licenses to handle pesticides and 96 percent of respondents said they had never been asked to show a license to buy the chemicals. “The first line of defence is a healthy agro-ecosystem. Pesticides and chemicals should not threaten the welfare, health or lives of farmers and their families,” said FAO’s Country Representative in Cabo Verde, Rémi Nono Womdim. 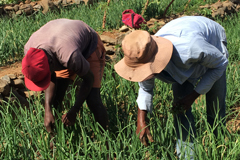 Cabo Verde is widely seen as a success story among island nations for its adoption of the Integrated Pest Management (IPM) methodology as fostered by FAO’s Farmer Field Schools (FFS). The schools involve a group-based learning process that has been utilised by a number of governments, non-governmental organizations (NGOs) and international agencies to promote IPM since it was developed some 30 years ago. A high use of pesticides was also noted in Guinea-Bissau where over 80 percent of the 200 rural families surveyed said they did not use protective equipment while handling pesticides. Moreover, nearly 90 percent had no knowledge of the available alternatives. Again, on the island of São Tomé, of the one hundred rural families approached as part of the study, almost 70 percent said they did not wear protective clothing while applying pesticides. Furthermore, some agricultural workers described feeling ill following exposure – a factor deemed especially concerning given the lack of adequate access to healthcare dedicated to intoxications and poisoning incidents. Farmers on São Tomé however, said that they were using alternatives to pesticides in large part thanks to the island’s rich biodiversity. Manipueira – which is a liquid extract from cassava roots – was cited as being more efficient than chemical farming methods for its possible multi-purpose use as an herbicide, fungicide, insecticide as well as a bio-fertiliser. “Manipueira has many functions. It helps soils preserve their natural nutrient content, and, it can also be used as a fertiliser, an insecticide as well as helping to combat pests,” said one farmer. FAO is calling for urgent action to be taken to secure the future and food security of Small Island Developing States (SIDS) against the disproportionate effects of climate change. The Organization warns that those heavily dependent on climate-sensitive sectors such as fisheries, tourism, and agriculture bear the brunt of climate change and rising sea levels although they contribute the least to it. Those Portuguese-speaking African countries (PALOP) that are also classed as SIDS, face a series of shared problematics spanning from increasing productivity in a sustainable way while diversifying agricultural production to enhance resilience in food and nutrition. Boosting communities’ capacities to use pesticides safely while encouraging the use of alternatives is key to protecting their livelihoods. A drastic reduction in pesticide-use is essential as it generates social, environmental and economic benefits, while contributing to the achievement of the Sustainable Development Goals (SDGs). In May, governments and stakeholders from all over the world will meet at the Conference of the Parties (COPs) in Geneva, Switzerland, to take decisions on chemicals and waste. Adapting farming methods to reduce exposure to toxic chemicals is a global challenge and will be top of the agenda.